Fowler's deluxe Dial Gage Stands holds indicators and probes for thickness and comparator work. 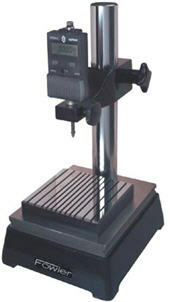 Round working surface of 2-1/4"
Diameter of column is 1"
Working surface of 3-1/2" x 3-1/2"
Serrated working surface 3-3/4 x 4"
Steel column with a height of 9" and a diameter of 1-1/4"
Fowler's cermaic and steel stands with rack and pinion design affords maximum accuracy when using high resolution electronic gages and probes...a must when highly critical measurements are required. 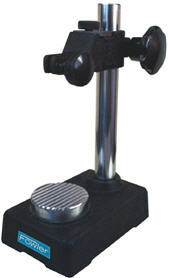 Fowler's High Precision Dial Gage Stand No. 52-580-011 is 10" in overall height with a precision serrated anvil. 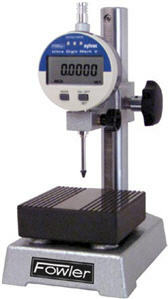 Total height of column 8"
Fowler's High Precision Dial Gage Stand No. 52-580-014 is 14" in overall height and is supplied with 2 anvils; flat and serrated. Total height of column 14"